Evolution of Contemporary art paintings from the pre-historic time. Contemporary art paintings broadly cover the time right from post-World War II up to the present time. The styles of artwork in contemporary movements differ extensively from one to another. Through this article we would like to make a small attempt to cover almost all the key movements of contemporary art, and to elucidate how they are interconnected to each other. Some of the key contemporary art span between the 1950s and 1960s mainly included Pop Art, Neo-Dada, Abstract Expressionism, Minimalism and the New York School. The most distinguished artists from this time mainly included Andy Warhol, Wassily Kandinsky, Robert Lichtenstein and Jackson Pollock. The former art movements of Cubism and Fauvism have been believed to be the main source of inspiration for these new directions that has taken place. The period of 1960s was basically constituted the initiation of modern culture, and modern art was a most imperative part of it. Eventually, the traditional form of art became the part of mainstream with these new contemporary styles of artwork which had gained popularity and appreciation among the populace. Ever since the 1970s, the additions had been supplement to contemporary art have all been technology based with digital, software and installation art. This style of artwork has consistently developed in parallel with technology and even today successfully going off in new directions. One comparatively fresh and very up-to-the-minute art movement nowadays is “Street art“, which can be taken as evolution of the former work of art i.e. Graffiti. There are various other new movements which probably are seeking to break free from the mundane pattern of traditional form art, as for instance we can say that Abstract Expressionism had tried the same 60 years ago. The independence of mind to create and imagine remains strong point in contemporary artists today, and they have made their gateway from simple usage of different canvas or painting techniques, so as to use entirely different forms of expression to portray their adroitness, as you can find in the Installation art of artists, such as Dan Flavin. 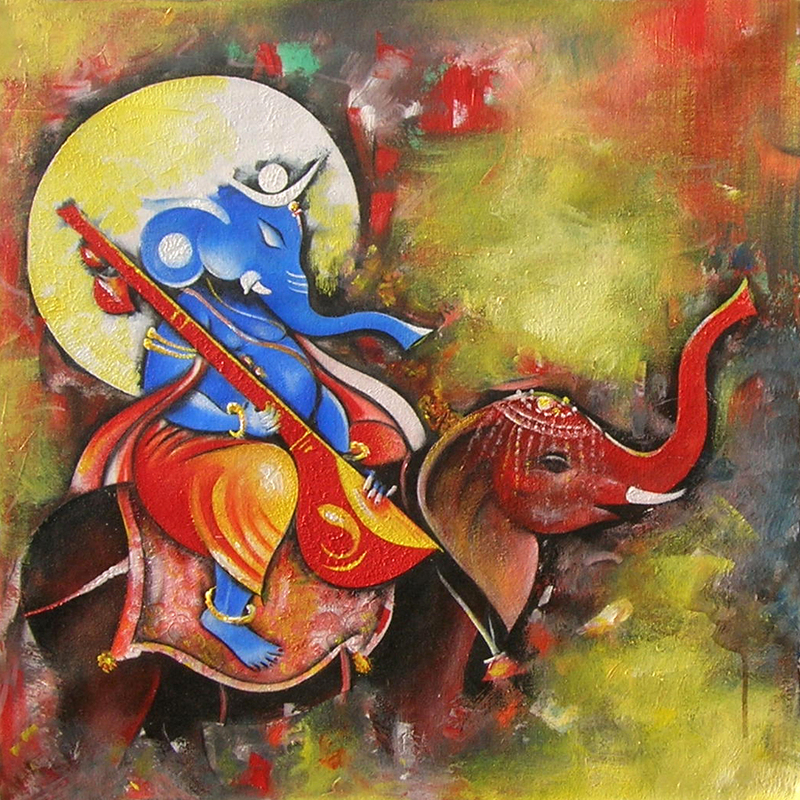 There are many distinguished artists who are coming up with remarkable paintings and you can buy these Indian art paintings online at reasonable prices. In the nutshell, we would like to say that contemporary art paintings embodies the completion of the evolution from Baroque and Renaissance painting, through Romanticism & Impressionism up to what we see today. The future for contemporary movements gives an impression to combine with the path of technology and other new directions which may be possible for all us to see in the near future. Watercolor painting is an art form that creates artistic representations, using pigments that are water-soluble. The traditional and most common support for watercolor paintings is paper; other supports include papyrus, bark papers, plastics, vellum or leather, fabric, wood, and canvas. Water color paint consists of four ingredients – pigments, a gum Arabic (binder), additives and solvent. Watercolors are usually transparent, and appear luminous because the pigments are laid down in a relatively pure form with few types of filler obscuring the pigment colors. Transparent watercolor allows for a freshness and luminosity in its washes and for a deft calligraphic brushwork that makes it a most alluring medium. Watercolor is a tradition that spans the chronicles of history. Primitive man used pigments mixed with water to create cave paintings by applying the paint with fingers, sticks and bones. Water color has been used for manuscript illumination since at least Egyptian times but especially in the European Middle Ages, its continuous history as an art medium begins in the Renaissance. The German Northern Renaissance artist Albrecht Dürer who painted several fine botanical, wildlife and landscape watercolors paintings is generally considered among the earliest exponents of the medium. The use of white space is very important in watercolor art. One of the basic abstract watercolor paintings techniques is to carefully avoid the areas to remain white and apply the colors of the lightest shades first, before applying darker shades. Many artists prefer to make small thumbnail sketches to begin with; it also gives an idea of what the final product will look like. Dark colors are often used in a modern watercolor painting to create dramatic effect around the center of the object. For instance, in watercolor flower paintings, bright colors may be used for the flowers and sharply contrasting dark colors would be used around the flowers to enhance their beauty. In the same way landscape watercolor paintings are often enhanced by using dramatic colors in the sky. The rise of watercolor painting style as a serious artistic endeavor progressed hand-in-hand with the improvement and commercial development of its materials. Original watercolor paintings of the masters and even of upcoming artists should not be deemed to have lower value than oil works. Just like with oil paintings, the price of watercolor original paintings is dictated by the theme and subject of the art as well as the size of the painting and the reputation of the artist. Naturally, the number of such paintings that are actually available is also important, as with any art rarity raises the price. Watercolors have dominated Asian art and still do today. Artists have started taking advantage of this unique medium to create striking works of art. Above all, watercolor painting is versatile, alternately offering rich, vivid tones or soft, soothing forms. Indian watercolor painters like Samir Mondal have also created their own niche by their most amazing contribution to Indian art of modern times in a continual revival of water color. Mondal has endowed water colors with the status of oils, projecting a facet of water color that was never visualized before. Another big Indian artist name in watercolor art is of Paresh Maity whose works are greatly admired by art lovers. He has made the early watercolor drawings of the Bengal village to spectacular watercolors from around the globe. His fascination of the people and colors of Rajasthan is reflected in a beautiful series of canvases. His warm, vibrant forms-though geometricized are replete with sensuousness. The vibrancy in the water colors makes the heavens and earth appear as one in a landscape watercolor painting; the artist inspires for a panorama to be altered as a rhythmical mystical experience instead of merely depicting an issue. It is most definitely the romantics who paved way for the abstract watercolor artwork to flourish, as over the years this has become the favorite of many art lovers. One can have a look at the online watercolor paintings showcased in online galleries, and see the versatility and beauty that watercolors have to offer. If you are a passionate art lover or collector do visit our art gallery which is and ultimate destination to buy and cherish the beauty of watercolor paintings.